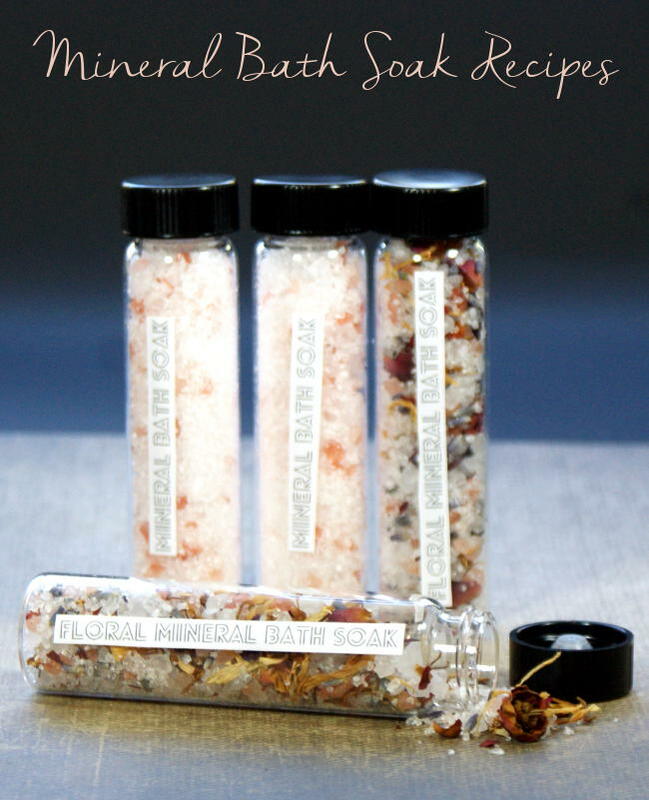 These natural mineral bath soak recipes are a snap to make and are the perfect end to a long day. 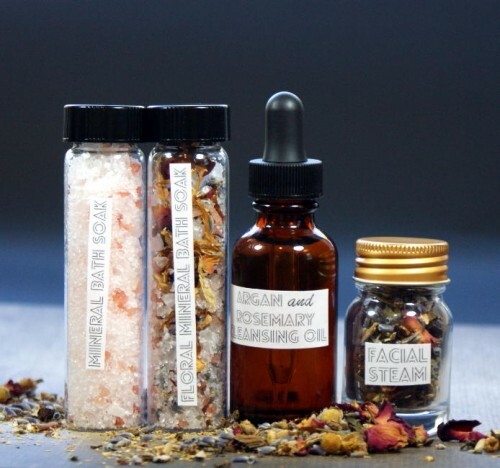 In addition to helping you wind down after a stressful day, these mineral bath soak recipes also help to ease sore muscles and detox skin! 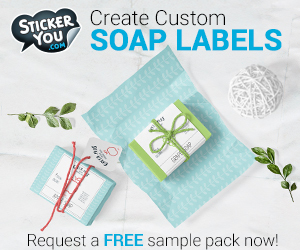 Leave them unscented or add some of your favorite essential oil(s) for a complete aromatherapy experience! 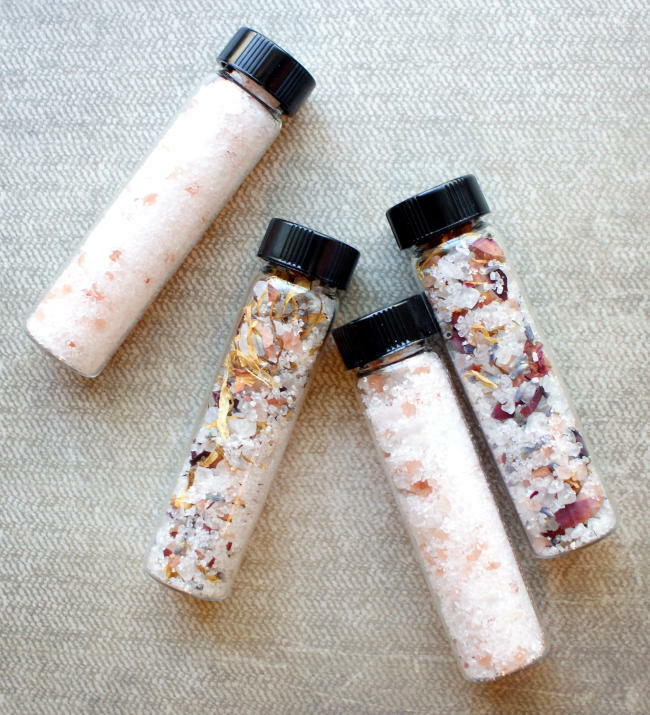 Available in bulk, these vials make it easy to fill with your mineral bath soak recipes for creating DIY wedding favors or bridesmaid gifts and even homemade stocking stuffers. 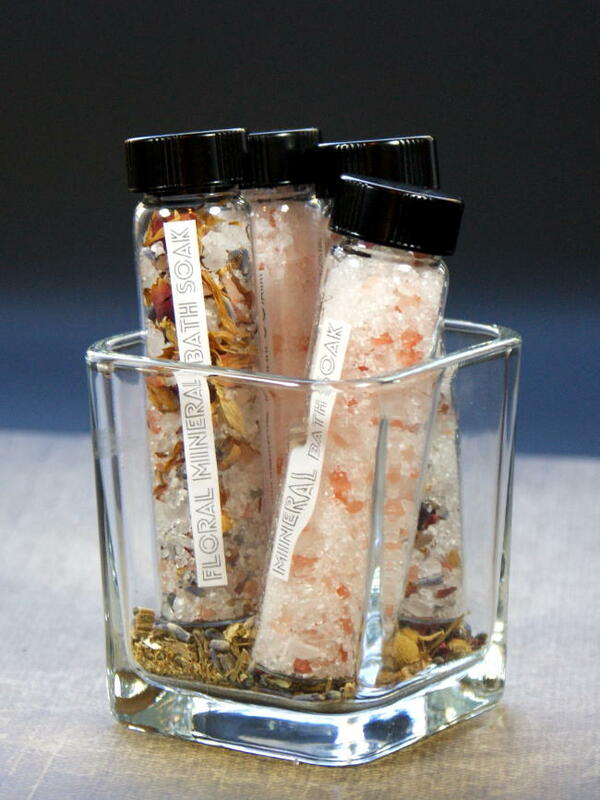 This particular mineral bath soak recipe fills 2 8-dram glass vials. As with the mineral bath soak recipe, use measuring spoons to measure out all of the cosmetic salts as well the flowers and combine in a glass bowl. Add your choice of essential oil(s) if desired and mix well. Use a small funnel to fill two 8-dram glass vials, then cap and label as desired. 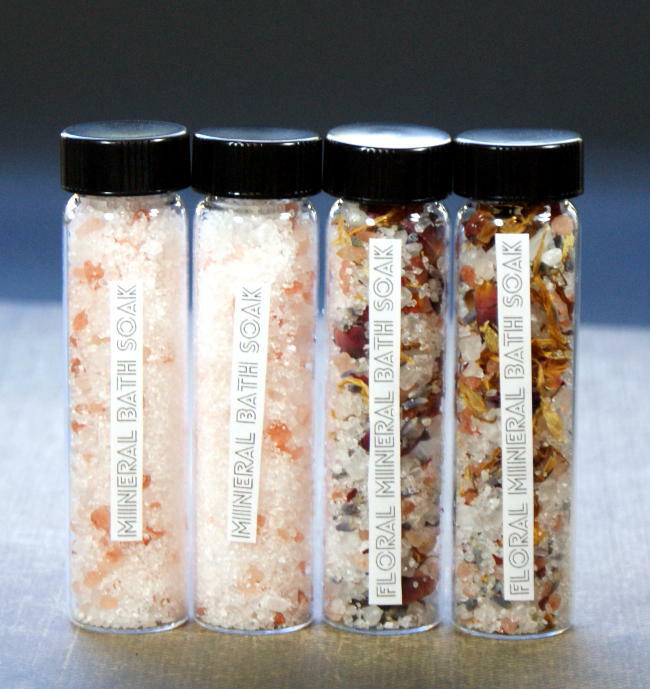 What’s so great about cosmetic salts? Dead Sea salt is extracted and solar dried from the saline and mineral rich marshes of the Dead Sea. As a result this salt is extremely rich in nutrients and contains an abundance of numerous key elements. It is widely renowned as the best therapeutic salts available. Epsom salt is a common ingredient in bath salts as it possesses properties that help to help sooth, relax, and relieve sore muscles. Comprised primarily of magnesium and sulfates, Epsom salt does won’t leave your skin feeling dry. Instead skin soaked in Epsom salts will have a soft and silky texture after a long soak. Himalayan pink salt is one of the purest salts available and is used both therapeutically and in cosmetic preparations. Derived from ancient sea salt deposits, Himalayan pink salt is believed to be the purest form of salt available. It offers essential minerals and trace elements, balances electrolytes, supports proper nutrient absorption, eliminates toxins, balances the body’s pH, and increases circulation. Sea salt is essential to good health and is used by the human body to function properly. The sodium in sea salt serves as an electrolyte and assists with regulating the electrical charges within our cells while chloride supports potassium absorption, enhances carbon dioxide transportation, regulates body fluid levels, and is an essential component of digestive acids. Sea salt is great for softening and rejuvenating the skin as well as relaxing muscular aches, pains, sunburns, rashes, and irritated skin. 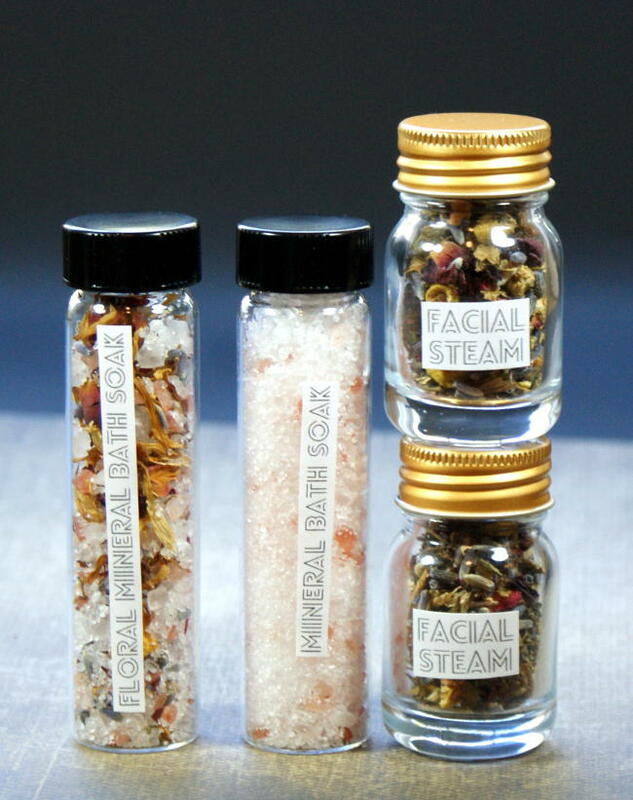 If you like my mineral bath soak recipes, you may also enjoy my DIY herbal facial steam. My DIY herbal facial steam is not only easy to make, it’s also a great way to naturally reduce acne breakouts, boost circulation and remove toxins. You can learn how to make your own DIY facial steam here. Or try my easy argan and rosemary facial cleansing oil recipe. This simple facial care recipe requires just two ingredients but delivers incredible results! This all natural facial cleansing oil recipe combines argan oil and rosemary essential oil for a simple yet effective cleansing oil suitable for all skin types. It easily removes makeup, dirt and oil and helps to prevent delicate facial skin from drying out due to the overuse of soap and water. You can find my argan and rosemary facial cleansing oil recipe here. For more natural DIY beauty products be sure to follow me on Pinterest, Blog Lovin’, Tumblr, Facebook, Twitter, G+ and Instagram.